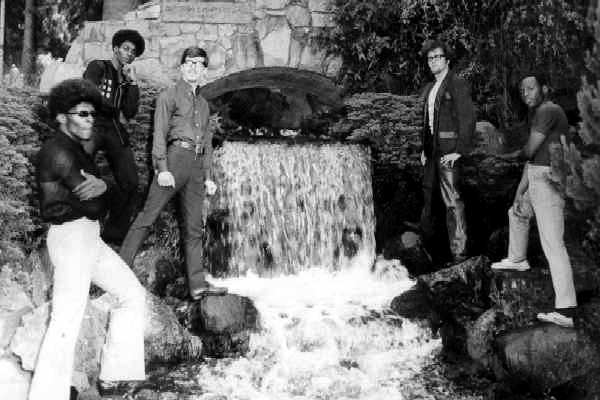 * On "Sweet Soul Lady" and "Until the Real Thing Comes Along"
This band got it's start in Seattle as the rhythm section for "Mr. Clean and the Cleansers" (Lee Taylor) working at the "Soul Cellar". After leaving that situation to form their own band they adopted the name "The Black and White Affair" at the suggestion of George Horton. Although controversial, a name was needed immediately in order to secure an important overseas tour. Interestingly, there were no negative incidents regarding the racial implications of that name during this time of social unrest. Their first recording (Sweet Soul Lady and Until the Real Thing Comes Along) recorded at Karney Barton's Audio Studio (Seattle, WA) on the Topaz label (produced by Greg Barnes) did very well on local R&B radio. Bootleg sales nationwide were considerable but not verifiable. Shortly after the initial success with "Sweet Soul Lady" the band relocated to Los Angeles to take advantage of a record deal offered by Gula Matari Records (Quincy Jones, Ray Brown), management by Vincent Andrews Inc. There they played at most of the popular Hollywood gigs such as The Whisky, The Factory, The Daisy Chain, Gazzaries, Club Arthur, etc. Unfortunately success in L.A. was not fulfilled due to certain conflicts. This band tended to change drummers frequently. David Domineck was the original founding drummer and he did record "Sweet Soul Lady" and "Until the Real Thing Comes Along". James Adams was the next drummer and he still lives in the Seattle area. After James came Robbie Hill, Robbie remained with the group for the rest of it's existence except for a short stint by (the phenomenal) Wayne Bibb. Calvin Law (Hammond C3, Vocals) was the dominant personality of the group and leader in most musical aspects. His dynamism and powerful vocal style were perhaps the defining aspect of the B&W sound. As a band leader he had complete control of endings, live mid song transpositions, dynamics, multi-tags, and impromptu segues, all live via hand and arm signals. After returning to Seattle "The Black and White Affair" went through several relatively successful derivations from "The "Black and White Affair", "The "Black on Black Affair", to "The Family Affair" (Robbie Hill).